What's better on a hot day than a tall glass of ice cold lemonade? Not much! This fizzy & fruity twist on the classic is a great way to beat the heat this summer. So, mix up a batch and enjoy! 1. In a pitcher, stir together the water and honey until the honey dissolves completely. 2. Stir in the cherry juice and lemon juice. 3. Pour 2 cups of the seltzer water into the pitcher. Gently stir. This makes a strong lemonade, perfect for serving with lots of ice (which will water it down). Add more seltzer water to taste. 4. 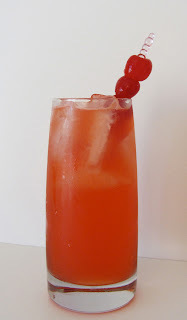 Serve over ice and garnish with cherries.